Weld Heads come in a vast array of configurations. Avio weld heads come in two major divisions, being monolithic type, and modular type. Monolithic heads are an all in one type weld head with a fixed force range. Some of these are air operated, and some are manual. Different models cover different force ranges, electrode diameters, and electrode orientations. Modular heads are composed of different combinations of components. 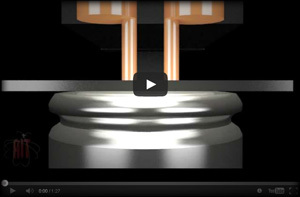 The system head is chosen by electrode orientation and force range needed. The drive unit is chosen by how the user would like to control the head, either air, manual, or servo. Holders, bases, and stages are all chosen for the type of electrode orientation, and electrode size needed. All these above mentioned components are then mounted onto the appropriate base and pallet, unless they are otherwise being integrated into some type of automated machinery. Avio has many modular configurations available. Sunstone heads are more like monolithic heads. The illustrations below show the opposed electrode orientation, and the parallel electrode orientation, for modular Avio type weld heads. You can click on the different labels/links around the images to see the Avio components in detail on another page of this site. Continue reading below for more discussion about various weld head options and configurations. For Sunstone Weld Heads, click here. 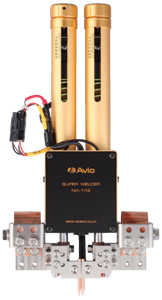 For Avio weld heads , click the links around the images below. Electrode Orientation refers to whether the electrodes approach from above, or from both sides of the work piece. Opposed designs have a bottom and a top electrode. Typically the bottom electrode is fixed, and the top electrode moves and provides the down force. Some types of heads like the Avio NA-43 have the electrode oriented horizontally instead of vertically. Parallel designs have both electrodes approaching from the same side, typically from the top. Parallel designs are further broken down into Parallel and Series weld heads. 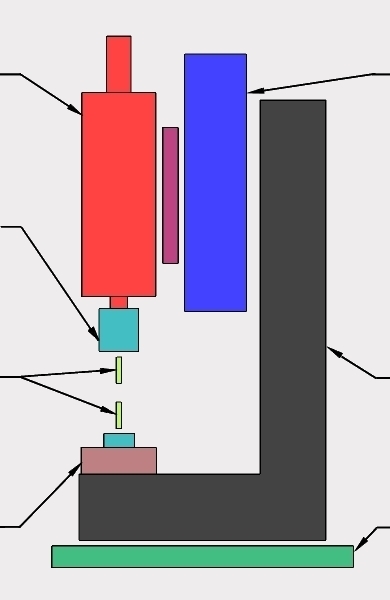 True Parallelheads hold both electrodes in a fixed relationship to each other, meaning that the electrode tips must touch the work piece at the same time under the force of a single spring. These type of electrodes can be bonded together with an adhesive insulator, or free such that the electrode holder sets the height relationship between the left and right electrodes. Series type weld heads have double springs, such the the left and right electrodes are independently spring loaded. This allows each electrode to come to a resting point on the work piece under their own pressures, compensating for varying work heights. Most battery tab welding is done with this type of head. 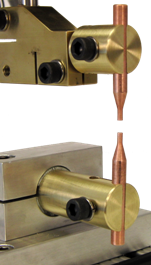 Both Opposed and Parallel heads come in a variety of actuation configurations. Air operated heads are actuated by a foot switch that fires a solenoid, which applies compressed air to an air cylinder, which in turn drives the head downward. 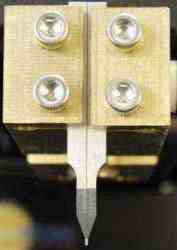 As the head is driven down, a switch fires the weld sequence when the head achieves the correct down force. Then afterward the solenoid releases the air valve, which retracts the upper electrode. Manual actuated heads have a mechanical foot switch that the operator uses to pull the upper head down. 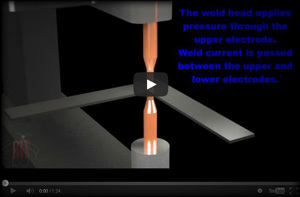 When the head senses that it has achieved the correct pressure, it fires the weld cycle. The operator then releases the foot switch, allowing the head to retract. Servo actuated heads use a servo driver and servo motor to drive the head down to a set position each time. These are used for greater speed and control over the welding process. For example, a servo head can rapid very quickly to the work piece, decelerating a millimeter before the electrodes touch, and then applying pressure softly as the electrode contact the work piece. Monolithic heads are typically either manual or air operated. Electrode holders also have options for what type of electrode they can hold. Some electrodes, mostly the parallel design, are square or rectangular bodied. Other types are round bodied. The round body electrodes typically come in 1/16", 1/8", 1/4", or 1/2" diameter designs, or their metric equivalents in the case of Avio electrodes.